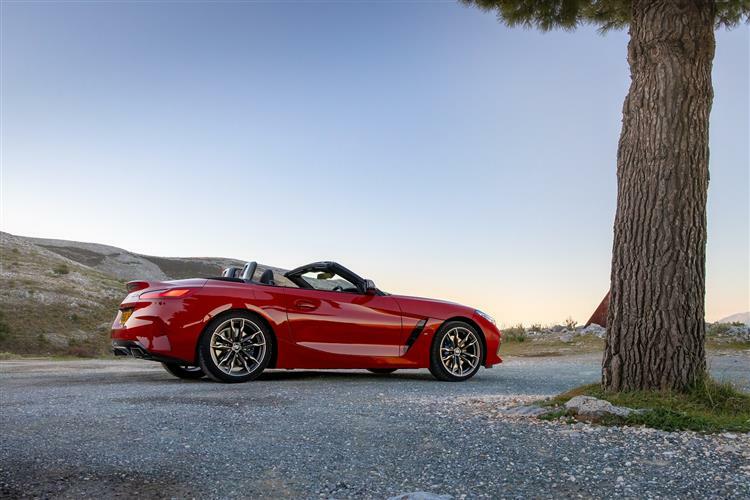 BMW knows a thing or two about roadsters and this third generation Z4 is one of its best. It may not be the sharpest car in its class to drive but on the right day, in the right mood on the right road, you may not care. The engines are efficient and willing, the looks are stunning and the feeling you get behind the wheel still makes you feel twenty years younger. This, it seems, is a Z that might be very hard to catch. 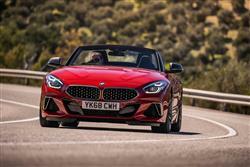 It took BMW some time to discover a profitable sweet spot in the roadster segment but the Munich maker got there in the end. Having first brought us an exclusive low volume model in this sector (the Z1 of 1989), the brand finally launched an affordable volume contender (the 'E36'-series Z3 of 1995). That sold well enough to be replaced by the slightly larger and more mature first generation 'E85'-series Z4 in 2002. Which itself was replaced by a second generation metal folding-roof 'E89'-series Z4 design in 2009. With the history lesson completed, let's acquaint you with what we're looking at here, a MK3 'G29'-series Z4 model launched in late 2018 after development shared with the new-era Toyota Supra. It claims to be something its direct predecessor really wasn't - a really serious driver's car. A really serious Porsche 718 Boxster rival. A really serious roadster? Let's find out. 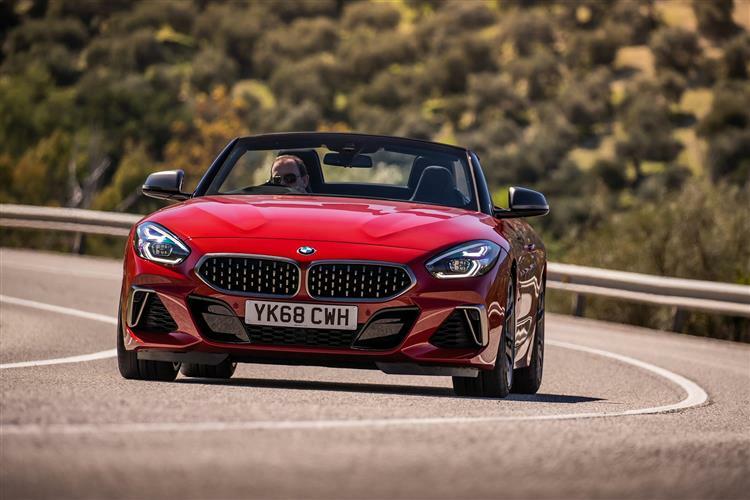 Sporting BMWs may have been inseparably associated with six cylinder engines down the years but the key powerplants on offer in this 'G29'-series Z4 line-up squirt fuel into the quartet of cylinders boasted by a TwinPower Turbo 2.0-litre unit that's offered in two states of tune. The 197hp sDrive 20i and 258bhp sDrive 30i variants are more powerful than the models they most directly replace; even the sDrive 20i can make 62mph from rest in just 6.6s on the way to 149mph. 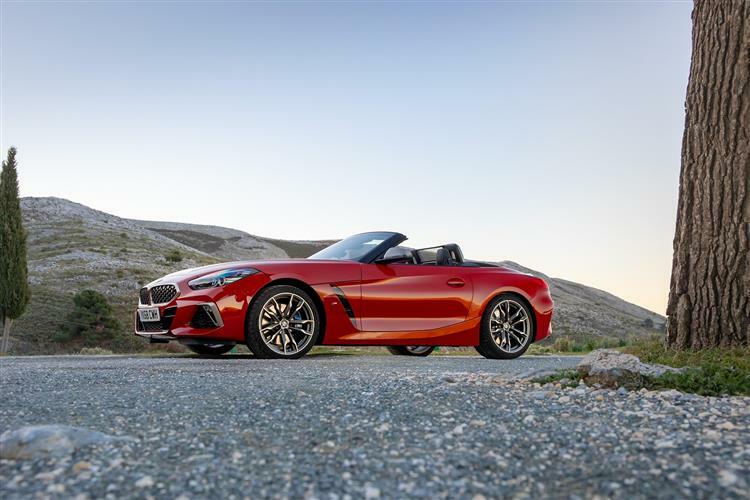 At the top of the range, you can have a traditional BMW straight-six unit, courtesy of the 340hp unit fitted to the flagship M40i derivative, which sprints to 62mph in 4.6s and has to be artificially restrained at 155mph. You can talk to your dealer about a manual version of the base sDrive 20i, but otherwise, all variants come fitted with an 8-speed Steptronic Sport auto gearbox with gearshift paddles. You're probably going to want to pay extra for adaptive damping - only the M40i gets it as standard, along with uprated brakes and an electronically controlled differential lock. The way the suspension interacts with the steering, the throttle and the differential is key to the way this car responds dynamically, so proactive use of the provided drive modes is crucial if you're pressing on. Perhaps the biggest news from a design point of view is the decision to replace the previous model's metal folding roof with a fabric top. the change really was a no-brainer. The new soft roof operates in around ten seconds, about twice as quick as the previous tin top. Plus it lets in less noise on the move and slightly lowers the centre of gravity. 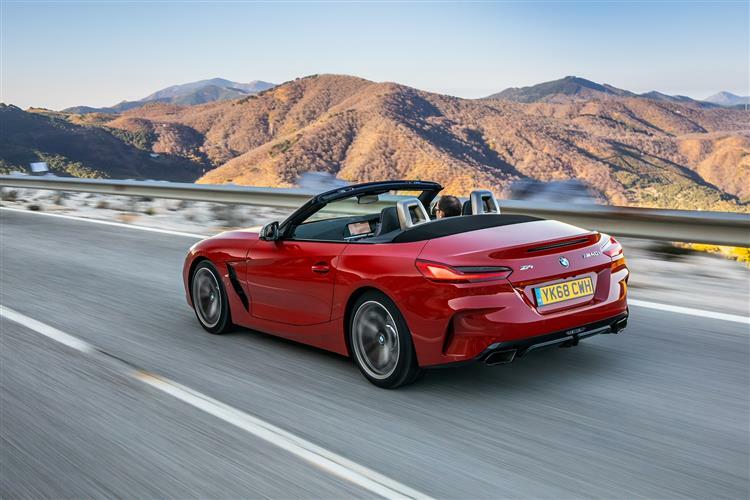 More practically, it allows for the same amount of luggage space whether the roof is up or down (265-litres) instead of the previous car's 310-litre roof-up / 180-litre roof-down unhappy compromise. In proper roadster style, there are no rear seats. 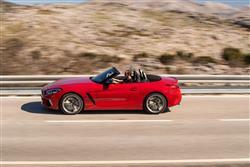 At the wheel, it's nicer than a 718 Boxster, which is presumably what Renault was aiming at. The level of fit and finish are almost faultless and there's a lot more interior space and storage than you'd expect to find in a roadster. 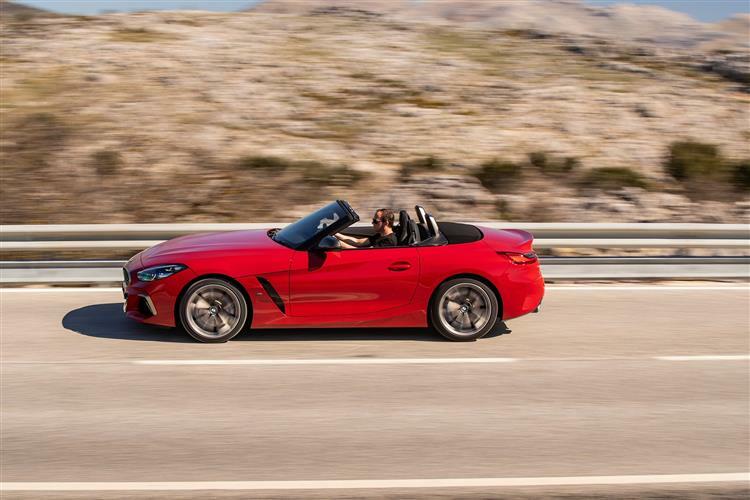 There's also plenty of evidence that the Z4 has entered the digital age. You get the same fully digital instrument cluster that's found on the brand's latest 3 Series and 8 Series models. And a huge 10.25-inch centre-dash iDrive infotainment screen. This features an adaptive navigation system, a hard-drive-based multimedia system, two USB ports, plus Bluetooth and Wi-Fi interfaces. 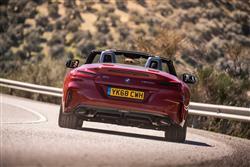 List prices suggest that, allowing for a few well-chosen extras, you'll probably be paying somewhere in the £37,000 to £50,000 bracket for your Z4. Almost all BMW's business here is done with the four cylinder 2.0-litre petrol engine that powers the sDrive20i and 30i variants, leading to an average Z4 purchase price in the £40,000 to £45,000 bracket. There's an £8,500 step up from the sDrive 30i to the M40i, so you've really got to want that flagship model's six cylinder engine. The list of options includes Active Cruise Control with Stop & Go function, plus there are various Driving Assistant systems, as well as a BMW's 'Parking Assistant' package, including a 'Reversing Assistant' feature that can reverse the car back automatically along the path just taken. This Z4 is also the first roadster to be made available (as an option) with a Head-Up Display. Safety can be given a further boost by opting for the Adaptive LED headlights. 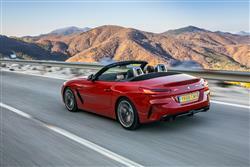 And with the optional Comfort or Comfort Plus packages fitted, the soft-top can be operated using the car key. The ambient lighting, fitted as standard, brings a particularly atmospheric mood to the cabin. LED fibre-optic guides light up the instrument panel's accent strips on either side of the steering wheel and provide indirect illumination of the centre console's edging, accentuating the areas of the cockpit of most importance for focused driving. These days, even barnstorming sports cars need to keep running costs in check while treating the environment with kid gloves. The Z4 does a better job of this than you'd credit for a car in such a lofty performance bracket, mainly thanks the BMW's EfficientDynamics programme. Thanks to this, assuming you keep an eye on the optimal gearshift indicator, you should be able to get somewhere close to a combined cycle fuel figure which for the four cylinder engine is quoted at around 49mpg on the combined cycle, whichever state of tune you order it in - sDrive20i or 30i. And 138g/km of CO2. As for the six cylinder M40i model, well you're looking at 33.2mpg and 165g/km. Routine maintenance is dictated by 'Condition Based Servicing' that monitors oil level and engine wear, taking into account how long it's been and how far the car has travelled since its previous garage visit. To help plan ahead for the cost of regular work, at point of purchase you'll be offered a 'BMW Service Inclusive' package that lasts for three years and 36,000 miles. BMW offers a warranty that lasts for three years, no matter how many miles you complete.